Atanga Nji at it again: Plans to Ban CRM, a political party that can oust Boys like Bouteflika. That villainous fellow has chosen to be in the news these days, though always for the most repugnant reasons. Just after claiming in a press conference that more than 152,000 displaced persons from the crisis plagued Southern Cameroons have received the poisonous so-called Humanitarian Assistance Aid, he has now turned to ban a protest March organized by the CRM of Cameroun political Prisoner, Maurice Kamto. In a recently published press release, the narcotic minister of Interior for La Republique, Atanga Nji has banned a planned protest by the most vibrant political party in that country. This is all efforts to avert any possible uprising that can send packing the ailing Biya same manner like Algerian’s Bouteflika. The overzealous ‘minister of Territorial Administration’ has promised to see the totalitarian and dictatorial regime gain firm roots in La Republique even as the hitman continue his massacre job in Ambazonia. The Cameroun Renaissance Movement, CRM, is the most authoritative political party now in Cameroun that is giving the regime some headache. 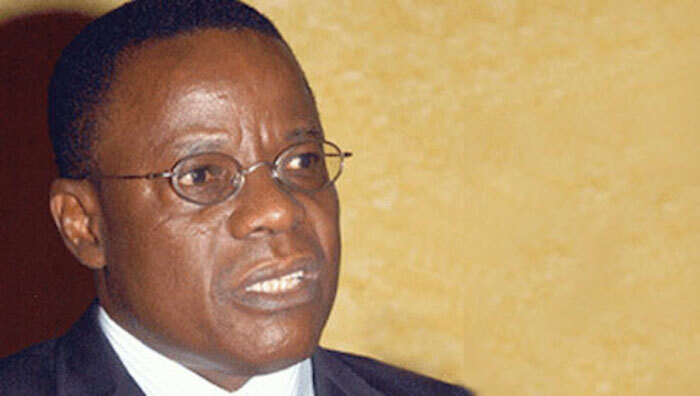 Its leader, Maurice Kamto is in jail for no crime committed, but for claiming victory in the farse and fraudulent October 2018 presidential election that saw biya winning overwhelmingly. Nji Atanga in his communique further describes the 6th to 13th April peaceful protest by CRM as criminal and a threat to “State Unity”. Last year, this same stands Nji intervened in the affairs of other parties like CPP of Kah Wallah to sack it’s national President prior to the election of a new president. The level of interference in Press and other Parties affairs in neighboring La Republic is still a cause for concern. This Atanga Nji of doubted character has been given full rights to play Biya’s role on the field. beiya’s running dog, atanga nji is threatening citizens of french cameroun. bieya’s running dog, atanga nji still thinks he wills power in french cameroun. it’s all over for bieya and his criminals unless french camerounesse are a bunch of cowards, can only talk loud but fear to die for their freedoms. nji shall fight 16 million camerounese on the street of yaounde… that’s a sight to detest! nji never succeeded in the Republic of Ambazonia of only 8 million strong. If this running dog is able to quell any demonstrations in french cameroun, the world will surely call this french colony, cowards and fools. We the people of Ambazonia have resolved to rather die free than live like french cameroun cowards. biya and atanga have already killed 12,000 of us and displaced more than half a million. beiya’s thirst for human blood cannot be quenched only by 8 million Ambazonians — he must go after more blood in french cameroun. As the world watches Ambazonians die, I hope and pray that french cameroun be spared of bieya’s thirst for human blood. Where do you and Sumelong Ekane get your stats from? The international community is smarter than you think, and thus, can’t fall for “alternative” or manufactured facts. Your so-called struggle is based on lies. I hope you read Mr Ayah Paul Abine’s candid take on the so-called struggle, nay, his strongly worded criticism or attack. At least, the fact that his wife couldn’t buy fish to cook because of the so-called lockdown, helped open the eyes of his understanding. He lambasted, blasted, castigated, the ambazonia crap.